Registrations are now open for the 2017 Griffith JDS Tournament – Sunday 26th February! This entry was posted in General Club Info on February 17, 2017 by Bec Byrne. Lend a hand (and a wheelbarrow) to the Griffith Tennis Club from 7am Saturday 18th February 2017 to re-sand the clay courts. Bring a shovel, if you have one, to make short work of a much needed job which will benefit the Club. This entry was posted in General Club Info on February 9, 2017 by Bec Byrne. The Griffith Tennis Club Term 1 coaching program, with our new Head Coach, Danny Dossetor will commence shortly! Danny brings experience and talent from his achievements in playing US college tennis and the ATP circuit, offering fitness and skills training through the squad program or private lessons. Check out the Coaching Schedule for more information and contact details for enquiries. This entry was posted in General Club Info on January 24, 2017 by Bec Byrne. Registrations are open for the Summer tennis competitions, for more details, please read the Summer Competition Information Form below. Competition registrations are now open for the Spring tennis competitions. 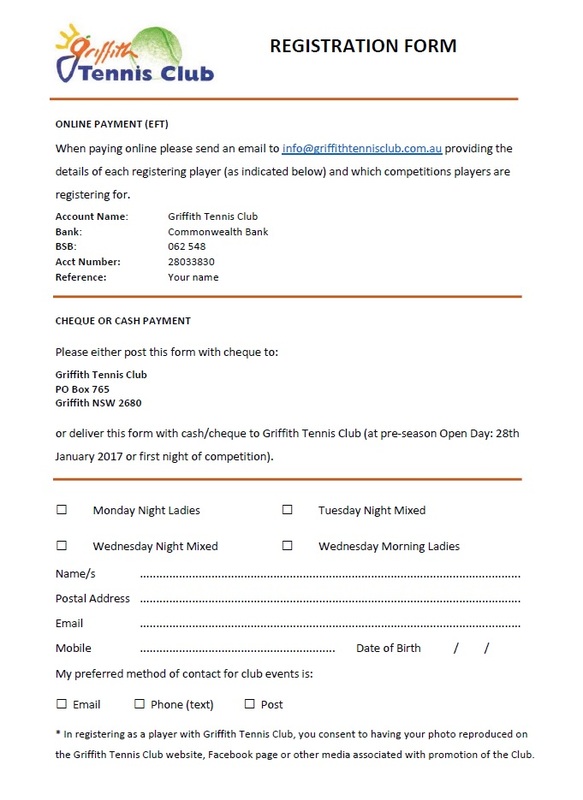 Registration fees for competitions now include Tennis club membership covering Insurance and NSW Tennis affiliation fees. This entry was posted in General Club Info on August 22, 2016 by Steven Bourke. 2016 MIA Open Championships is on again on the June long weekend. registrations are closing soon Bronze AMT 01/06/16 and all other Graded, Junior and Family events 04/06/2016. This entry was posted in General Club Info on May 25, 2016 by Steven Bourke. Griffith Tennis Club will host the NSW South West JDS on the Sunday 20th of March. To register click Registration JDS. Entries close Friday 18th. This entry was posted in General Club Info on March 14, 2016 by Steven Bourke. GTC AGM to be held 7.30pm 8th of March 2016 at the Club house. This entry was posted in General Club Info on March 6, 2016 by Steven Bourke.